General Electric has come out with a new locomotive it says is more fuel efficient and reliable than older models. It also wants to roll out a hybrid locomotive some time next year, and recently announced a $100 million plan to build batteries for trains. 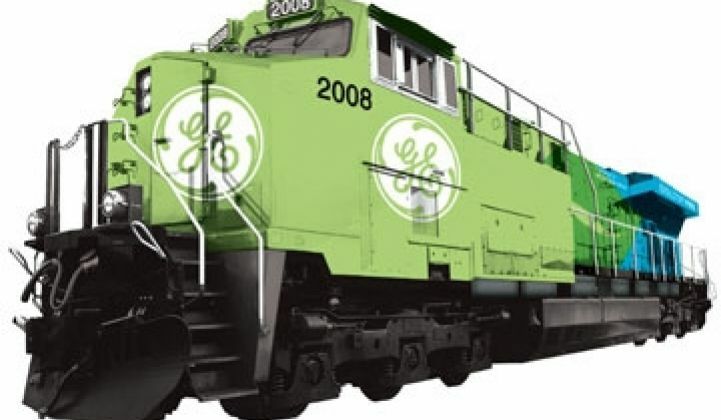 General Electric has come out with its latest "green" locomotive, part of a broader push it is making n the field of fuel-efficient rail transportation. The ES44C4, the latest in GE's "Evolution Series" locomotives, uses an alternating current motor instead of the direct current motors typical in older locomotives. That will make it 17 percent more fuel-efficient and cut greenhouse-gas emissions by about 70 percent compared to older models, it said. The new locomotives also have fewer parts, making them easier to maintain, GE said. Burlington Northern Santa Fe Railway has bought 25 of the new locomotives so far. GE wants to sell more, obviously. It says that 600 of the new locomotives can do the work of about 800 older ones. That switch would lead to fuel savings of about 70 million gallons per year, equivalent to taking about 115,000 cars off the road, the company said. GE is putting a lot of money into better train technologies. 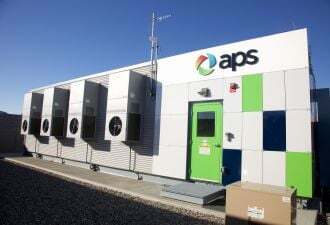 Last week it announced it would put $100 million into a new battery factory in New York. The factory, which GE is seeking stimulus funding to help build, will make sodium batteries aimed at, among other things, powering its upcoming line of hybrid locomotives (see GE Aims at Energy Storage for Trains, Grid). Railroads are already about three times more fuel efficient than trucks for freight hauling, according to railroad company CSX. That efficiency has led some to consider railroads as a "clean" form of transportation as they stand today (see Green Transportation Fund Set to Launch). But trains also present a host of potential efficiency gains, like capturing the energy used in slowing them down through regenerative braking, much as Toyota's Prius hybrids capture braking energy. The energy used in braking a 207-ton locomotive over the course of a year is equivalent to the power used by about 160 homes, GE says. Replacing all the pre-2001 locomotives in the country with GE hybrids that use regenerative braking – granted, an unlikely event in the near term – would lead to emissions reductions equivalent of taking a third of America's cars off the road, GE claims. GE isn't the only one looking to better ways to power trains. Maxwell Technologies announced in December that it would test its ultracapacitors in a Korean Railroad Research Institute project to capture braking energy of subway trains (see Maxwell Ultracapacitors to Capture Subway Braking Power). Not all efforts to supply the railroad industry with more energy efficient technology have borne fruit, however. Canadian hybrid locomotive maker Railpower Technologies, which was trying to make locomotives used in railroad yards to split up and put together rail cars, filed for protection from its creditors in February. Railpower had to recall models to correct problems that could lead to engine fires, and found that most railroad companies preferred to downgrade old, tired main line locomotives for yard work instead of buying new ones, according to the New York Times' Green Inc. blog.